The enforcement of traditional American Building, Safety, and zoning codes is what separates us from third world countries. 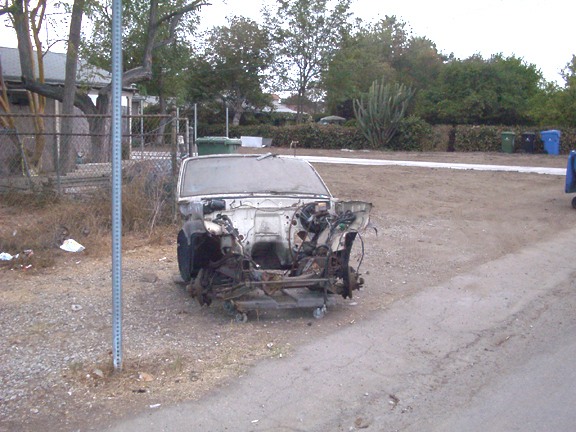 Van Nuys and parts of the Valley have taken on the look of a third world country due to the lack of pro-active code enforcement and the L.A. City Council's misplaced efforts to "Stamp out Blight." It is amusing that the head of the Van Nuys DBS (Department of Building and Safety) claims to be "Pro-Active" (says so right on his business card). The DBS is anything but pro-active! Noticing that the City of Burbank has absolutely no illegal vendors on its streets, I called the Media Information Officer at the Burbank PD, and asked how they were able to keep illegal street vending to zero. He told me that unlike the LAPD, they had a policy of enforcing illegal vending pro-actively. I told him that the LAPD says they don't have the resources to make proper enforcement of illegal vending possible. He said that is because they let it go for too long. I asked if the Burbank PD had the resources to do the job. He said they don't need many resources because the policy of zero tolerance has been established -- illegal vendors know they will be arrested, so there are no illegal vendors. I told him that the LAPD complains that they cannot arrest anyone and leave their goods behind -- their goods must be impounded. The Burbank officer told me that they may not have the resources, but they are resourceful. If an officer encounters an illegal vendor (extremely rare in Burbank), he/she will get the proper agency to pick up the goods. If it is impossible to impound the goods at the time of arrest, they put caution tape around the cart and/or goods, making it a crime scene -- later someone will pick up the stuff. But that happens so rarely, it isn't even an issue. 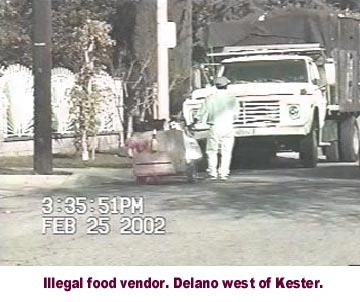 The scenario in Van Nuys is like this: the prime enforcer, the LAPD washes its hands of the problem by passing the buck to to the City Council, the City Council washes its hands of the problem by passing the buck to the DBS, where the buck stops -- never mind that illegal food vendors violating zoning laws are exempt from the Los Angeles County Health department rules (a health department which forces L.A.'s legitimate restaurant owners to pay to have themselves given sanitation grades) before they go home at 4:30 pm. Then while the illegal vendors enjoy doing business in L.A. without legitimate competition, without paying taxes and without overhead, the word goes out to the cartels south of the border via the "hotline," that it is legal to be illegal in Los Angeles. The DBS says that they cannot bust zoning violations after they go home at 4:30 pm nor on weekends which they have off, unless they get overtime approved. So when a citizen phones the LAPD after 4:30 pm or on weekends to report a zoning violation, nothing gets done about the problem. If the LAPD finds the time to answer the complaint, they simply tell the violator that they are not in compliance. 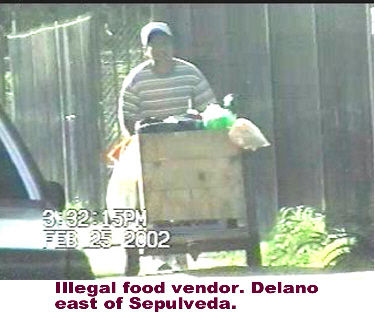 Illegal vendors know that if they don't carry IDs, they can't be cited, and they know that it's too much trouble for the LAPD to arrest them -- so illegal vendors ususally move their vending operation to a new location. Most of the time, they return in 15 minutes to the location they were told to leave. Most illegal vendors know that the DBS won't bother them as long as they operate their illegal vending operations on prime time -- after 4:30 weekdays and anytime on weekends. As it is, the DBS has to put in for overtime to bust illegal vending operations. This is costly and useless because by the time the overtime is approved (could be several weeks), the illegal vendor has long been gone from the reported location and found a new location. We've been hearing new phrases among the L.A.'s elite, like "quality of life" and "stamping out blight." But the rhetoric does not address the stretch of Van Nuys Boulevard between Saticoy Street and Oxnard Boulevard in Van Nuys. In Van Nuys there is no shortage of reminders that City Hall isn't paying attention to the Valley. To name a few, There's the old Valley Federal Building, once considered the best building in the region. 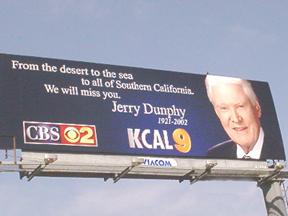 Now it's empty, as it has been since the 1994 Northridge Earthquake. 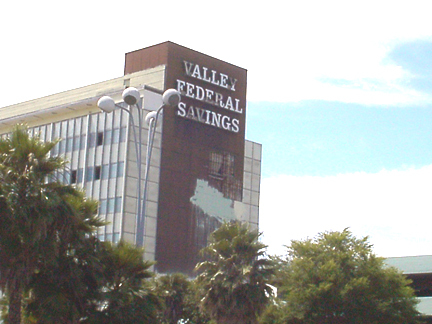 Broken and boarded-up, with windows that are mostly shattered, Valley Fed's old building stands empty and in disrepair. The only signs of life are the weeds in the parking lot, which have sprouted up through the cracked concrete. Elswhere in the neighborhood there is the former Asian Ranch Supermarket, the former Chief Auto Parts building and several other unused structures and strip malls. The blight feeds off itself, scaring new businesses away from the area and driving out the few that still remain. City Hall has been ineffective to raze old buildings or attract new developers to take them over. Instead, the L.A. City Council has pretended to tackle the issue of blight by launching an anti-business attack on the billboard industry -- as if the elimination of billboards would fix the problem. Downtown Van Nuys might as well be on another planet away from downtown Los Angeles, which the city leaders have diligently worked to improve with the new cathedral, Staples Center, and the $300 million face lift for City Hall.-- to name just a few. Meanwhile, Van Nuys and many other city neighborhoods stand in virtual ruin. While the Department of Building and Safety picks on, harrasses, and cites middle class homeowners for trivial violations such as sagging fences and untagged cars parked in private back yards, the DBS skips over the lower class homes and businesses. By failing to vigorously enforce housing laws, Van Nuys has turned itself into a haven for the poor and created a city of slums and high-end districts with a dwindling middle class. 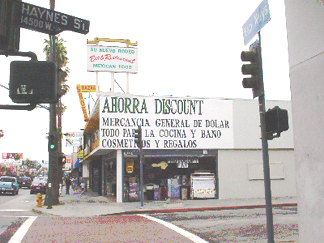 It is not surprizing that when Ahorra Discount, on the Southwest corner of Van Nuys Bl & Haynes Street, took over the building from the previous business (Rodeo Cantina) last year (2001), the owner completely modified the structure of the store to suit the new business without getting a permit. It is also not surprizing that the Department of Building & Safety knew about it for months -- but didn't cite the owner until other activist and I put the pressure on. In Van Nuys, many businesses ignore building codes. 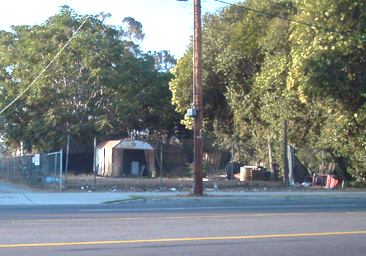 This property, filthy, with human waste abound, located on Saticoy Street near Sepulveda Blvd in Van Nuys, is home to squatters and vagrants. 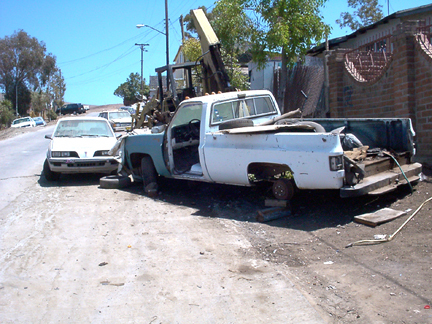 There is no pro-active code enforcement in some sections of Los Angeles. Because no one complains, the LAPD and the DBS don't bother to cite the owners. But even when someone does complain, little action is taken to make the owner comply. LA City Leaders should call for a zero tolerance policy with regard to serious zoning violatons and should call for a special permanant on-call DBS inspectors who can patrol for after-hour zoning violations and be able to immediately respond to citizens' complaints.